A measure of mean effective pressure in a cylinder of a reciprocating engine. It is the average in excess of ambient pressure inside the cylinder during the power stroke. It is measured in pounds per square inch (psi), kilopascals (kPa), or bars and relates to torque produced by the engine. BMEP can be calculated if the brake horsepower and RPM of the engine are known. BMEP is that portion of indicated mean effective pressure (IMEP) that produces brake horsepower. 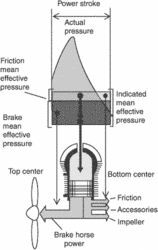 The remaining pressure used to overcome internal friction is called friction mean effective pressure (FMEP). Due to the adjustable vane oil pump, which increases the oil pressure at a brake mean effective pressure of between 6 and 8 bar and also simultaneously activate the piston cooling, an increase in oil pump friction can be recognized in this switching range. This very pronounced dependence with rising brake mean effective pressure can be attributed to the rising injection pressures of up to 2000 bar with simultaneously increasing fuel flow rates. The test results show that the final combustion of oxygenated blends ERO at late phases of the expansion stroke may lead to the lower emission of NO, CO, HC and smoke but does not contribute to having better brake mean effective pressure, higher thermal efficiency and biofuel savings at a high speed of 2200 [min. The brake mean effective pressure of the engine running under heavy loads, [lambda] = 1. The variation of CO emission on volumetric basis with respect to brake mean effective pressure for the various fuel blends and neat diesel are shown in Fig. 6 shows the variation of hydrocarbon emission with brake mean effective pressure under various compression ratios. The NO emissions of the engine using different fuel blends and neat diesel with respect to brake mean effective pressure for the compression ratios 15, 17 and 19 are shown in Fig. The black smoke emission resulting from combustion of diesel-ethanol-biodiesel blends and neat diesel are plotted against the brake mean effective pressure in the Fig.